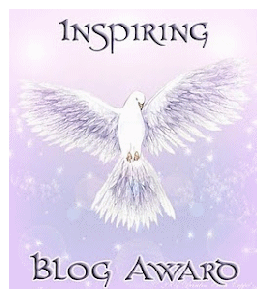 I have been given the Inspiring Blog Award and the One Lovely Blog Award by DaphneShadows. Thank you thank you, Daphne! I am so pleased that you enjoy my blog. Please take a moment to visit her blog by clicking here. I am going to follow Daphne’s lead and combine the rule of the two awards since they are almost the same. Thank and link back to the person who nominated you. Done and done! When life gets stressful, I escape with children’s fiction. I hate flying and tend to travel only close to home. I am addicted to Good and Plenty candy. I believe in the therapeutic benefits of a nap- as often as possible. 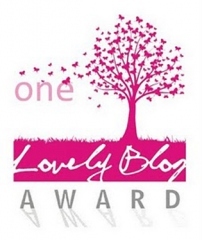 Daphne Shadows – blogaward-giver extraordinaire! Serious Pixie with links to her “Writers Don’t Cry” advice column on Amazon. Wordswimmer by Bruce Black – combining writing, yoga and life. Roots of She by Jenn Gibson – gives me courage to be myself. Purpose Fairy – how to live an inspired life! Judy Lee Dunn blogs about writing and blogging. Phew! That was tough to narrow down. There are so many wonderful blogs that I have come across in the last six months. Thank you to all of the above bloggers for inspiring me on a daily basis! Cheryl I’m with you, I like to escape through children’s fiction as well. And coincidentally that’s the sort of fiction I like to write! Writing it is as good an escape as reading it. That is my preference in writing as well. Cheryl, Thanks so much for the award, I’m honored! And naps, too. I’m all for a 20 minute siesta most days.